Every winter the Washington Department of Transportation turns a cold shoulder to a stretch of State Route 20 that winds its way through the Northern Cascades. This area sees so much snow and crosses so many avalanche paths that it is not feasible for them to maintain the road and keep it plowed. This stretch can see sometimes more than 60 or 70 feet of snow in some places. Every spring, we eagerly await the reports from the DOT as they start the clearing process. Depending on the snowfall and the avalanche conditions, this can take a few weeks, or a few months. This year, the highway was cleared and open by May 8, and climbers and skiers alike have already started enjoying the numerous routes there. The Liberty Bell Group from the East. Dana Hickenbottom. SR 20 cuts through the heart of the North Cascades National Park, and is the access for hundreds of peaks. One of my favorite areas along there is known as Washington Pass. 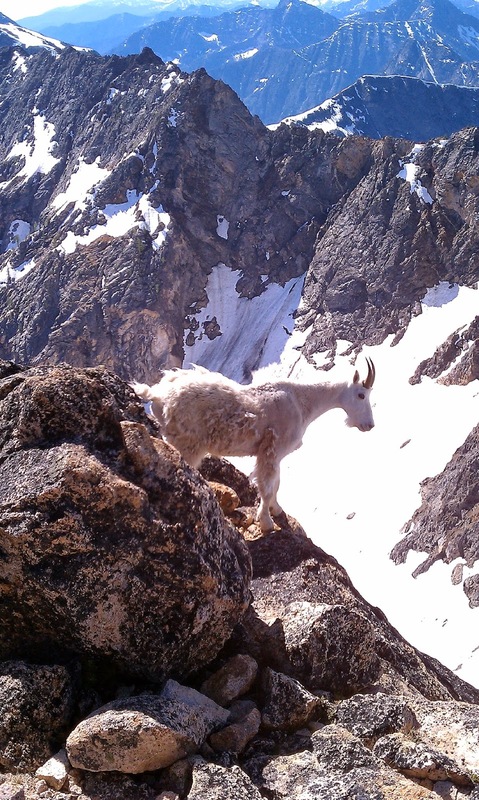 This Pass is home to some of the best alpine rock climbing in the state. The most notable formation there is the Liberty Bell Group, which includes Liberty Bell, Concord Tower, Lexington Tower, North Early Winters Spire and South Early Winters Spire. 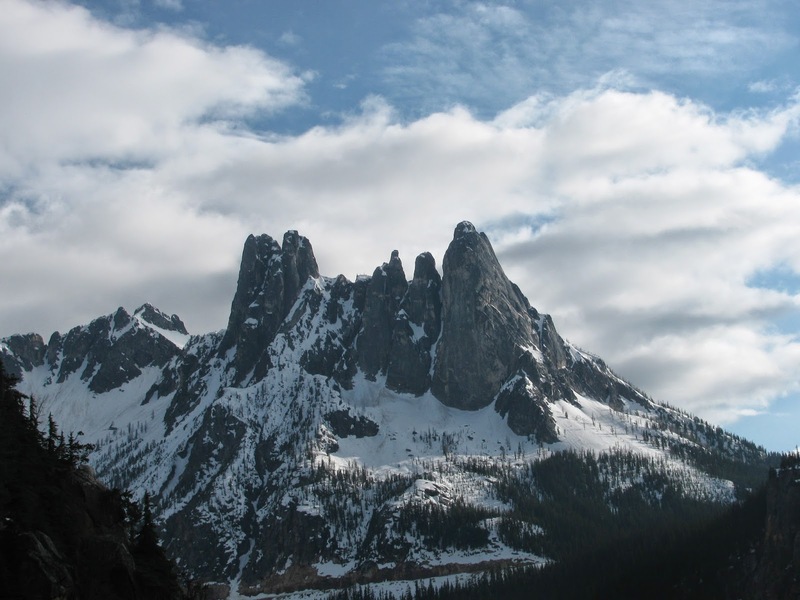 Each of these peaks have numerous routes on them ranging from 5.6 beginner routes to 5.12 Grade V monsters. However, the Liberty Bell Group isn't the only fine chunk of granite in the area. Another great is Cutthroat Peak, which is just to the north of Liberty Bell, on the other side of the highway. At 8050', it tops out at about 300' higher then anything in the Liberty Bell Group. When viewed from the east or west, you can see the distinctive North and South Summits, which form the shape of the salmon that it is named after. There are a hand-full of routes on the peak, mostly in the moderate range, although there are a couple in the 5.10 and over range, as well as some alpine ice routes. From the highway, you park at a broad pull-off south and just west of the peak, approximately 1.5 miles west of Washington Pass. Drop down into the drainage and start the brushy hike up the other side towards the meadows on the southwest of the peak. Ascend the northern-most notch of the Southwest Arm to get to the base of the South Buttress to start the real climbing. The South Buttress, shown middle-center in the photo below, is a great 5.8 route that follows the crest of the feature, with a few short sections that venture to the east before returning back to the ridge. If you find yourself getting sucked too far to the left, be sure to steer yourself back to the crest again. The majority of the route is easier climbing with a few short but well protected 5.6 - 5.7 spots. The crux of the climb (5.8) comes near the top, just before you start the final easy scramble. This takes you up to the first of the two summits. Above is a 360 deg. panorama from the summit of Cutthroat Peak. From this vantage point, you have spectacular views of the Liberty Bell Massif, Big Kangaroo Peak, Silver Star Peak, the Wine Spires, in to British Columbia to the north, and on a good day you can even catch glimpses of Mt. Baker. For the descent, you have two options. If there are no other climbers behind you, you can rappel the route. 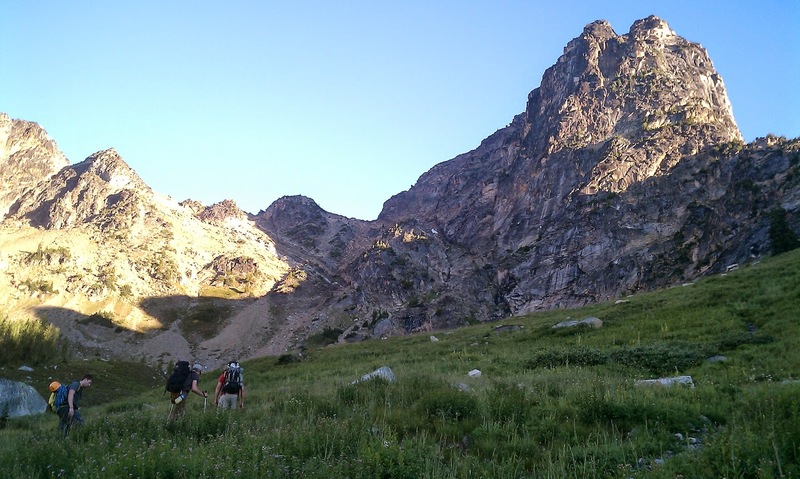 The other option is to continue scrambling and drop into the notch between the North and South Summits, ascend the North Summit and then rappel down the West Ridge route. 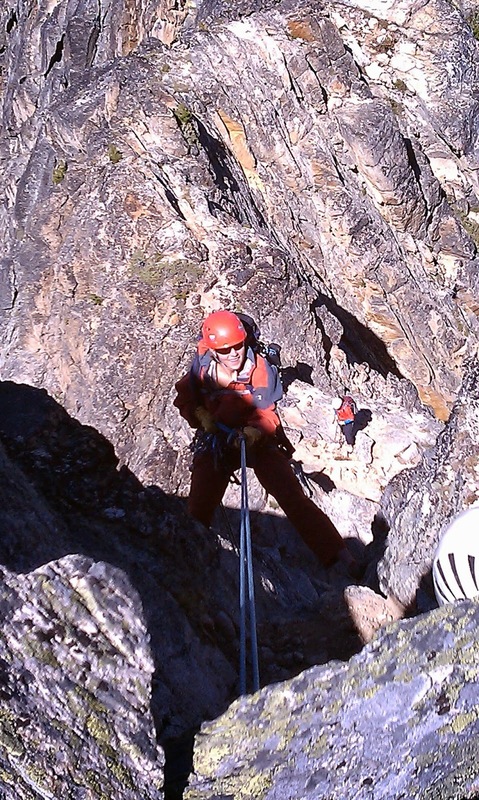 There are fewer rappels this way, but there is also some loose scree scrambling as you come off the West Ridge. Cutthroat Peak is often overlooked by climbers since its neighbors on the other side of the highway have such easy access. But with a little extra effort on the approach, you will find a great climb for anyone looking for a long, moderate climb with beautiful surroundings.